The Archer Hotel located on O’Connell St in the heart of North Adelaide, has so much to offer. With 17 beers on tap, a well-rounded wine selection and an amazing new menu there is something for everyone. The food on offer represents classic pub food with The Archer’s twist to make the menu that little bit more spectacular. The large menu offers items such as steaks, burger, lamb shanks, and much more. Today for lunch Adelaide Food Central was invited to dine at The Archer to sample their new food items. We started from the small plates menu where we were presented with a board full of delicious food. The first board item was the Wood Grill Chorizo and warm olives with ciabatta. You can really taste the difference from a wood grilled chorizo compared to a normal grilled chorizo. The wood grill chars the sausage so that the beautiful smokey flavours are infused into the meat. You could also tell that the chorizo was of top quality as it was not only salty but a brilliant texture in the mouth. The olives were a perfect accompaniment to the dish. Also on the board was the Archer Fried Chicken with Mota mayo, black sesame and sweet potato chips. Wow this fried chicken was like no other. We noticed that the meat has been buttermilk battered and gave out a beautiful bright orange colour. The batter was extremely crunchy but not the type of crunch you usually find on deep fried chicken. The meat itself was not too oily and you felt a little less guilty eating it. The creamy Mato mayo added a tangy component to the dish and paired well with the chicken. 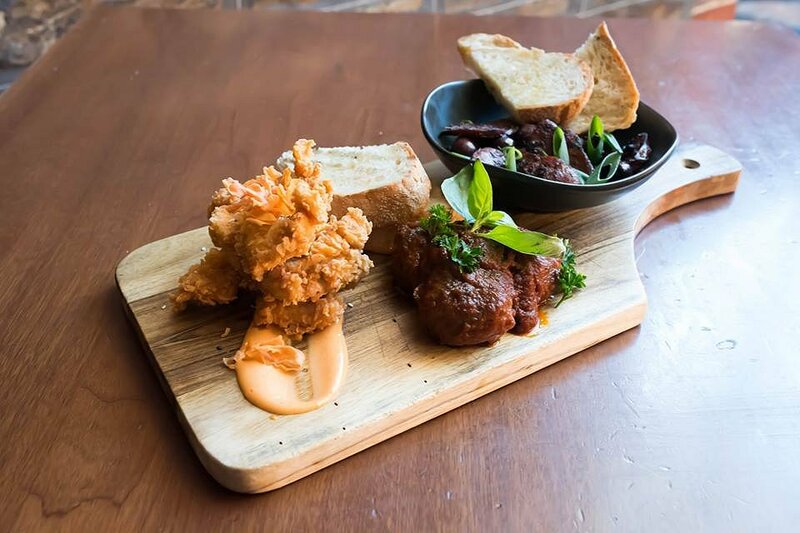 The final board item was the Pan Fried Veal Meatballs with sugo sauce and charred bread. These juicy meatballs were cooked to absolute perfection and there is honestly nothing I could fault about this dish. The rich tomato sugo that slathered the meatballs was authentic and tasted just like Nonna’s. The meatballs were slightly pink in the middle, which made the dish that little bit more fantastic. 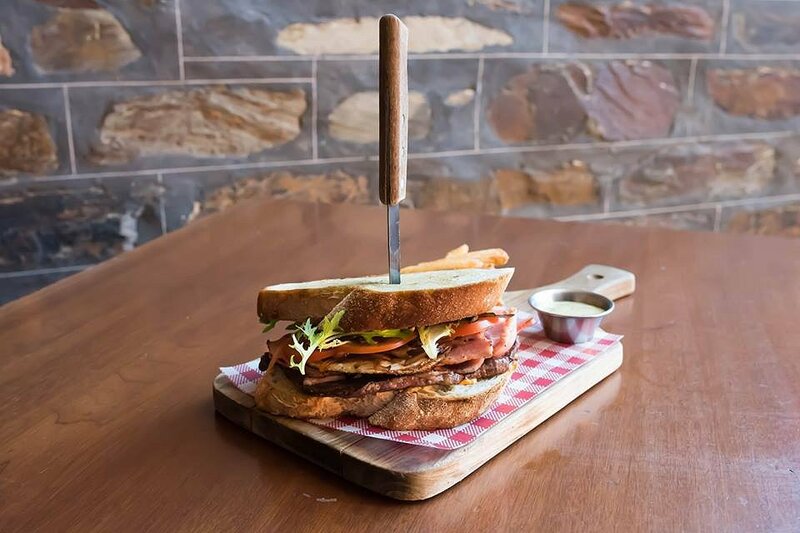 To start off the larger dishes, we had the pub classic, the Steak Sanga with fried egg, bacon, lettuce, tomato, chilli mayo, caramelised onion served with chips. Now this steak sanga was absolutely brilliant. It is often that in a steak sandwich the meat itself can be quite chewy and difficult to eat. The steak in this sandwich was cooked perfectly and melted in the mouth. The bread held together the juicy steak, runny and yellow egg, vegetables, and the ever so slightly spicy chilli mayo. The chips that accompanied the sandwich were thick cut and salted perfectly. 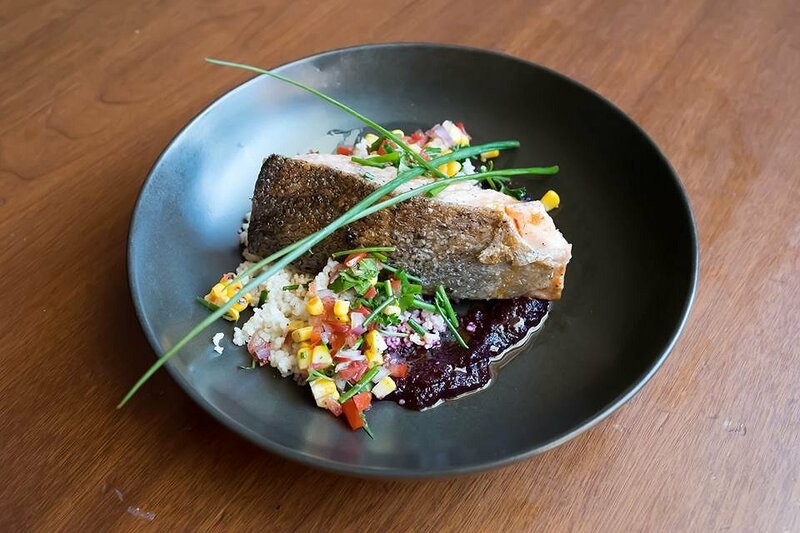 We then went onto the new school menu section where we tried the Crispy Atlantic Salmon with spiced beetroot puree, lemon cous cous, charred corn salsa and paprika. Fish is generally my least favourite item on a menu so it is not likely I would normally order this dish. But I am so glad that I was able to try this beautifully cooked Atlantic salmon. The salmon itself was pink, almost raw but as the fish was such a fresh, beautiful steak it could be eaten like this. The skin was salty and crispy and accompanied the soft cous and crunchy sweet corn. The gorgeous spices of salsa and paprika added a flavoursome element to the dish. Next up was the 6 hour Slow Braised Lamb Shanks with butter and chive mash and gremolata. This dish was extremely homey and something your grandmother would cook you when you are feeling sick. This dish was beautiful; the lamb just pulled right off the bone and melted in the mouth. Every second mouth ful you could taste hints of chives and the gremolata, which was a pleasant surprise and added another dimension to the dish. The serving size was very generous and I thoroughly enjoyed these lamb shanks. 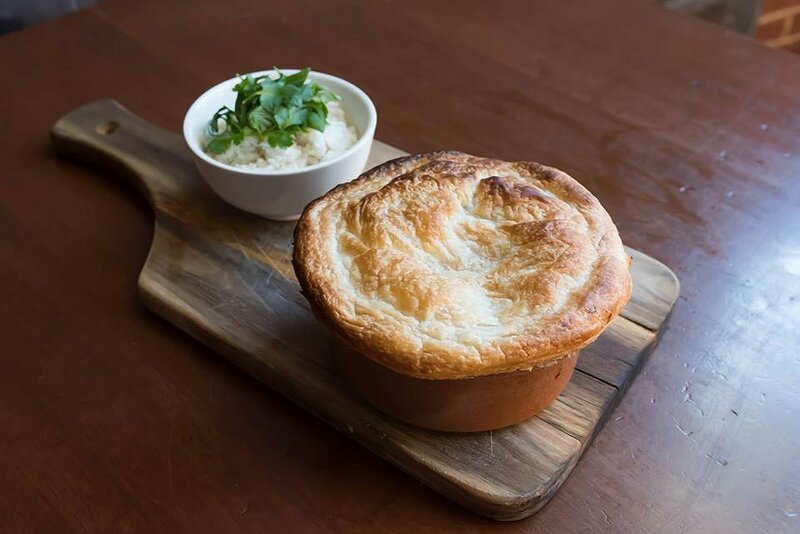 The second to last dish was the Butter Chicken Pot Pie and aromatic rice. I was a little bit unsure about this dish, as a butter chicken pie is not something I have tried before. The pastry on the pie was puffed high and was cooked perfectly. The Butter Chicken had a beautiful aroma and the meat was juicy and succulent. Served in a generously sized pot, the authentically flavoured dish was swimming in a thick, creamy sauce. The rice that was paired with the dish was cooked al dente and was a nice texture in the mouth. 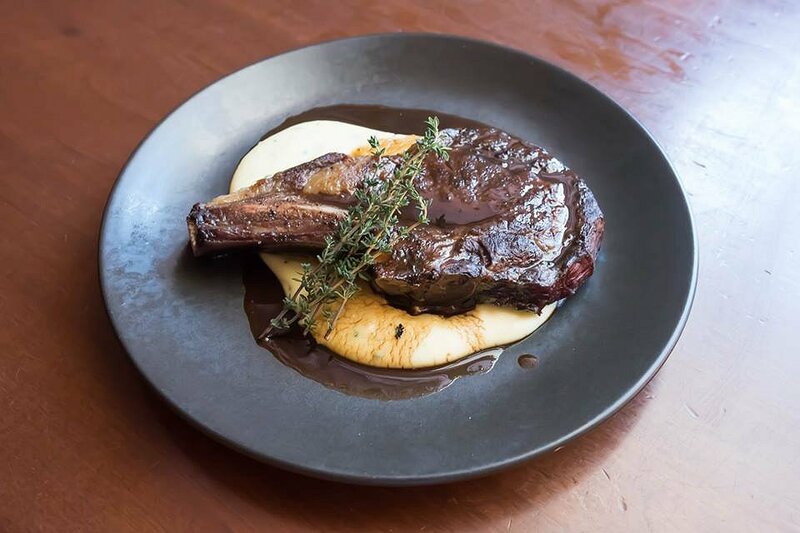 From the wood grill we had the 21-Day Dry Aged Rib Eye 350gm served with your choice of mash or chips and red wine jus. I can honestly say that this is one of the best cuts of meat and well cooked steaks that I have ever had. At first bite the meat just melted in my mouth, even the fat could be eaten with ease. The gamey meat flavours matched with the creamy mash that was accompanied by a sweet jus. Once again the wood grill helped to give the steak a smokey and remarkable flavour. This was by far one of the best dishes of the day and we highly recommend ordering this when at The Archer. The Archer is open from Sunday to Friday 11am-late and Saturday from 11am-2am. We would like to thank Sam and the team at The Archer for having us along to sample their new astonishing menu. 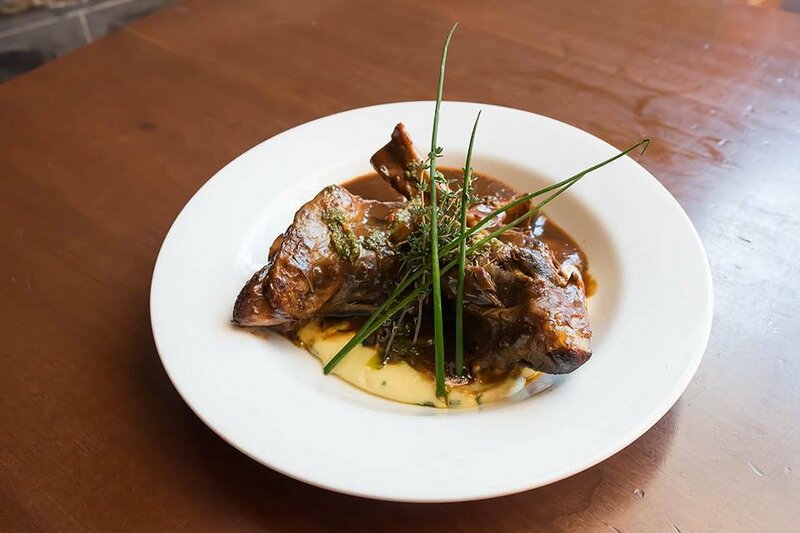 If you are looking for classic pub meal with a modern twist then head along to The Archer. They will not disappoint.